Fig. 5. 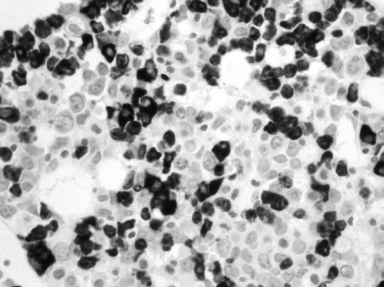 CD68 (PG-M1) expression in macrophages in this case of hemophagocytic syndrome. malignancies. Immunophenotypical information by IHC is of particular value when interpreting BMB in patients where marrow aspirates are unavailable (e.g., owing to myelofibrosis). CD34, TdT, CD117 markers, which are only expressed by immature cells, can be of particular value in assessing the proportion of blasts present in a BMB (11,12). This might be particularly valuable in highlighting small numbers of residual blasts in posttreatment samples (minimal residual disease). Acute myeloid leukemias (AML) are a group of neoplastic proliferations of BM precursor cells ("blasts") of granulocytic, monocytic, erythroid, or megakaryocyte lineages (7). Using an appropriate battery of lineage- and differentiation-associated immunostains, the nature of the blasts can often be correctly identified. MPO is positive in blasts of both neutrophilic and eosinophilic lineages. Cells of monocytic derivation are weakly positive or nonreactive. MPO immunostaining is more sensitive than cytochemistry performed on BM aspirates in recognizing minimally and poorly differentiated AML (13). Lysozyme represents a useful "back up" pan-myeloid antibody. Fig. 6. Staining a case of acute megakaryoblastic leukemia. (A) H&E. (B) Factor VIII antigen (von Willebrand factor). 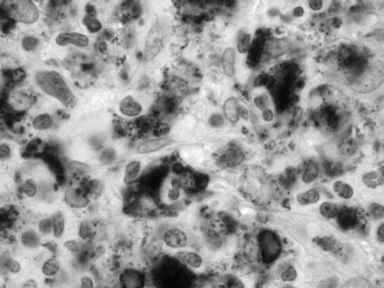 (C) Anti-LAT antibody expression in megakaryoblasts. PG-M1 epitope being preferred (8). CD163 represents another useful marker, which has recently become available (14). Acute erythroleukemia can be identified by the antihemoglobin (or anti-glycophorin A) immunostain. The stain(s) can also be used to confirm the erythroid nature of the "worrisome looking" proerythroblasts observed in patients with megaloblastic anemia. Fig. 7. 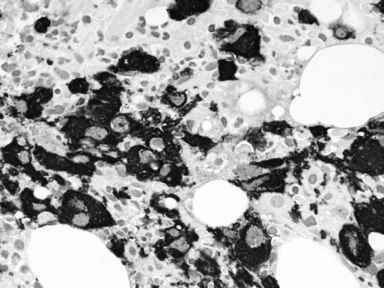 CD42b expression in large, abnormal megakaryocytes and megakaryoblasts in a case of acute panmyelosis with myelofibrosis. 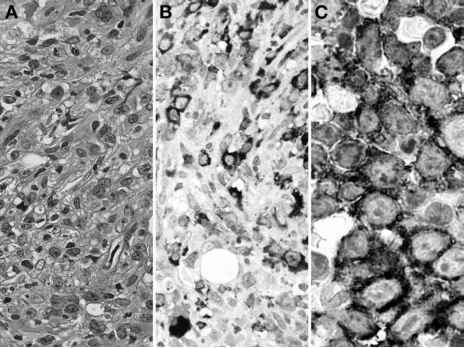 is useful in confirming acute panmyelosis with myelofibrosis and myelodys-plastic syndromes with fibrosis (MDS-f). ALL is one of the most common malignancies seen in pediatric patients. Although flow cytometry and cytogenetics retain their dominant role in the evaluation of ALL, paraffin IHC may provide important adjunct information. TdT, CD34, and CD99 positivity is used to confirm the precursor status of the leukemic cells (Fig. 8) (15). TdT is positive in almost all T- and most B-cell ALLs (11). CD79a is more frequently positive than is CD20 in precursor B-ALL. CD10 is positive in the majority of cases of precursor B-cell ALL, and, less frequently (40%), in T-ALL; TdT and CD99 are usually negative in mature B-cell ALL; in these CD10 and CD20 are strongly expressed. CD3 is employed, in conjunction with TdT, to identify cases of T-cell ALL. Other T-cell antibodies CD2, CD5, CD7, and CD1a can also be useful in selected cases.